We first met the horse two years ago when we stopped for lunch on a narrow but well-defined dirt road that had just summited and was beginning its descent. Jeff cut the engine and we opened our sandwiches, content to eat in silence and admire the view. Then through my open window, I caught drifts of whinnying and snorting. “We won’t see it. It’s too far off.” I hoped Jeff would contradict me. Instead the noises stopped. I finished my sandwich and divided the bits that had fallen onto my napkin, between our two hounds. I was about to suggest to Jeff that we continue on our drive when I glimpsed motion on the west side of the range. A bay stallion emerged, tentatively at first, then gaining confidence as he saw that we remained quiet in his presence. Instinctively I steadied my breath. Seemingly in response, he pranced toward us and began to circle the Land Rover. With his head held high and high pronounced steps, it was as if he planned to captivate us–and it worked. Jeff and I got out and gently closed our doors. We leaned on the hood, letting the horse take the lead, wondering what would be his next move–when inside the vehicle one of our hounds spotted the stallion, clamored over a pile of gear to a window and began to howl. Jeff rushed to quiet the dog while the horse cast me a look even my mother couldn’t summon on the most obstreperous day of my childhood. It took a few moments to settle the hound. When we returned our focus to the horse, we entreated him with pleading gestures and apologies, to no avail. He avoided our gaze. He snorted and pawed. He trotted, not so far from us that we feared we had frightened him but just enough that we knew he had scorned us. To further affirm his indignation, he tossed his mane before galloping into the canyon from which he had come. Grief came swiftly and with a solid heft, the sorrow of offending a cherished guest. Neither Jeff nor I spoke of the incident, not then, or any time during the two years that followed, though a couple of times we mumbled allusions to our guilt and our loss. Never did we indulge in the dream that we might one day redeem ourselves in the eyes of that horse. But the opportunity came, in November in the Kamma Mountains, after a day of tracking wild horses behind the Painted Canyon, and on the well-willow pass, and along Jungo Road, and near Rabbit Hole Spring. We drove in silence over the pass where we had last seen the stallion, on a road we had seldom driven since. It was neither a gray day nor a sunny day; neither warm nor cold. When we reached a familiar corner, I began to scan, grateful that my eyes were trained to spot a form, however small, against the tall ridges. “There?” But it was a boulder. “There?” I pointed to a dark spec at the base of a mountain about a half mile up on our right. My husband slowed the Land Rover. We stopped, rolled up the windows to muffle the sounds of the dogs, and got out. It was neither windy nor still. The air was not scented with sage as it had been in spring. We set one foot in front of another, angling toward the horse, eyes averted, steps silent on the powdery road. As we made our way toward him on that nebulous day, he began moving toward us. He trotted and stopped. Watched. Galloped. Stood still. Studied us. Made his way to the Land Rover, where he lifted his nose and sniffed, probably searching for that silly dog who has since died. Seeming satisfied, he roamed back toward the base of the mountain. I watched as my husband followed. Quietly. Slowly. Angling. Averting. Until he came within a few lengths of that horse. And stood there. Just stood there. We did and the wild horse walked with us. We walked and he followed. We stopped and he stopped. We began again, he began again. We pretended not to be completely amazed. Jeff paused as I continued up a rise in the road. A carved earthen bank on my left precluded me from seeing whether the stallion still followed. Until Jeff said, “Look up.” Eight feet above, stretched over a mound, peering down at me, there he was. Zooming in on images of this stallion, I found scars presumably inflicted during the course of nature. His right hind quarter, now fully healed, evidences shredding by a mountain lion or, seemingly less likely, a horse. In the midst of that finely etched field is a mass of tissue pushed up into the shape of a mountain. It is white-tipped, as if snow-capped. There also is a scar on the horse’s neck in the shape of a hoof. His tongue is out which could be a sign of nervousness or a sore mouth. He appears to live alone, leading me to surmise that, in his interactions with other horses, he could be contentious or otherwise challenging; in the world of wild horses, oft crossed lines are sometimes replied to with ostracization. To us, he has demonstrated grace and resilience, for which we are grateful. It is our privilege to bring you stories from the range of Nevada wild horses, and to support American Wild Horse Preservation Campaign and Wild Horse Education in their efforts to protect these and many other horses. I have always been fascinated by the deep connection some people enjoy with wild animals. This must have been such an amazing experience. I hope you get to see him many more times and get to know him much better! We also hope to see him more! Our relationship with him has truly been a unique and cherished experience. While back in the Kamma Mountains earlier this month we looked for him but did not find him. However, he exuded alertness and vigor during our last encounter with him, so we are confident that he is well. He has probably moved to an adjacent region to graze, as wild horses sometimes do in response to a season change. A wonderful read, sad for the horse to be an outcast. The horse must have welcome your company. This particular wild horse does seem to enjoy our company and for a wild horse to seek the company of people is much more the exception than the rule, so it is possible that he is lonely. The ostracization of a horse from a herd in response to challenging behavior, is a necessary consequence to maintain harmony in the herd so that it can function at its highest capacity. It could be viewed as the human equivalent of a “time out” and often applies to adolescent males when they become rowdy. I don’t know the age of this horse but he exhibits a self-assuredness that I don’t associate with juveniles. I wonder if he was left to fend for himself when he was injured, perhaps when he was young, and if that somehow shaped his personality in such a way that he doesn’t mesh with the other horses. Purely conjecture on my part! Your paths were destined to cross again. A truly magical experience and a magnificent, enchanting creature. I can see the defiant gleam in his eye. An outcast, maybe, but he’s the king of his own freedom. Happy spring, Viv. This horse is truly enchanting and lives vividly in our hearts. You’ve aptly described him and I think the fact that he is “the king of is own freedom” made this reconciliation that much more profound for us. Thank you for your note, Julie. Happy spring to you too. No animal should be alone. So sad to think of him out there roaming the wilds without the comforts of a herd. I’m so glad you made a connection Vivian and got to see the horse again. He probably craves company and although the wild mustangs of North America are just that. This wasn’t always the case of course as you know. The connection between horse and man goes back such a very long way. Thank you for sharing the reunion. I seem to remember you wrote about your original meeting too. Thank you for being a loyal reader with a good memory. I did mention this horse in one of my earlier posts. You’re right, the connection between horse and man goes a long way back. For us, a large part of what made our encounters with this wild horse such a gift, was that they occurred on the horse’s terms whereas, all too often, it is man who sets the terms. The first photo is just gorgeous, it would be a great painting. Thank you Kim. I had the same thought, that the first image would make a beautiful painting. I’m not a painter though. I had the photograph matted and framed as a gift for my husband. It’s quite lovely, and more so with the subject being so personal. It would have been lovely. What a wonderful story – hope to read many more installments. Thank you, Donna, I’m delighted that you enjoyed it and hope to be able to bring you more. Don’t you love how spiritual intuition always gives you the opportunity to heal grief? What a lovely story. With people, one hopes for and seeks the opportunity to make amends; with a wild animal, one hardly dares dream of it. This resolution was truly the grace of God. I’m delighted that you enjoyed the story. Thank you, Meg, for such a kind note. Your comment brings to mind an author I have long admired, Ellen Meloy, a desert naturalist who devoted much of her adult life to studying bighorn sheep. In her book, Eating Stone: Imagination and the Loss of the Wild, Meloy alludes to the desert wilderness as her church. Although I attend a conventional church, I understand her affinity and her profound need for that connection to the wild. I’m delighted that you enjoyed it! Thank you for joining us! I would want to take him home which of course, I could not. What a gorgeous story. Thank you! Thank you very much, Alison. It is a pleasure to be connecting with you, not only for your wonderful photography but also given that you seem to have such an extensive history with and knowledge of northern Nevada wildlife. How wonderful it is that you have had the opportunity to observe, for such an extended period, the stallion near where you work. Your perspective of him is very touching and in some small way it is a comfort to know that his particular challenges have not gone unnoticed. Vivian, this is a beautiful story of a magnificent horse. The love and respect you both have for wild horses shines brightly through your words. Gorgeous pictures. I’m glad that you were able to see him again. That is truly a treasure you’ve got there and inspiring stories like this makes people open their eyes to its magnificence. There are few countries in the world where this connection between free living horses and humans can be experienced, it is something to cherish. Thank you. Thank you for appreciating this story–the ability to experience these wild horses in their natural habitat is one of the highlights of my life. It is both a spiritual and a life-affirming experience. I pray that these horses will continue to thrive and remain free for future generations to come. Vielen Dank für euren Bericht. Ich habe Angst vor Pferden. Diese Begegnung hat etwas mystisches. Thank you for your report. I’m afraid of horses. This encounter has something mystical. I’ve always been somewhat fearful of horses, too. What I am learning with these wild ones is that they are all different. Some are fearful and run at the sight of us, some are indifferent to us, and some are curious and want to take a closer look. Not unlike with people. 🙂 Thank you for writing. “Obstreperous”, I love it. A woman who knows her vocabulary! And uses it! I enjoyed your story and photos. Our run-ins with wild horses are similar but looked no where as well groomed as your example. We live in Henderson, a suburb just south of Las Vegas. We came upon a small herd of horses one Sunday as they ambled down the middle of the tiny paved road we were driving on. They stared at us but would not let us pass. My wife stepped out of the car to pet them. Since then we have been back to the area about 4 separate times and have seen what we assume to be the same horses n sometimes larger, sometimes smaller groups. And it’s always awe inspiring! Magical story. To see a wild horse is just in my dreams. Of coarse sad too, to know he is alone. But nature is never Disneyland, it is nature, and for a wild animal the best world. What a beautiful and inspiring story, it’s amazing ! Isn’t it wonderful you could find the horse and could spend a little time with him ? You could give him a break from his solitude, even if just for a short time. I’m always amazed at how animals are so intelligent, so much more than what science tells us. You surely had a wonderful encounter with this horse and it’s great you could take a picture of him. Dear Jocelyne, I am honored that you took the time to write me, please accept my apology for the delay in replying. This story is one of my favorites in the history of my little blog. Our reunion with this horse was a special moment and, you are right, it does absolutely speak to the emotional intelligence of this magnificent animal. I will always remember the grace this horse exhibited, it is, quite honestly, more than I see in some humans. I’m looking forward to the day when we will return to the Nevada desert and meet him again. Your visit has brought me much happiness, I hope you are having a lovely summer! Blessings my friend! Great story Vivian, loved it. We always enjoy seeing them out in the Nevada Desert. Never been anywhere near that close. Thanks, Tim, we were blessed by our reunion with this horse. Visiting and observing the wild horses of the Kamma Mountains and surrounding areas is one of the highlights of our lives. On our last trip we saw the largest herd yet, in the Seven Troughs area. But as with the horses you saw, these were at a distance, we observed them through glass. 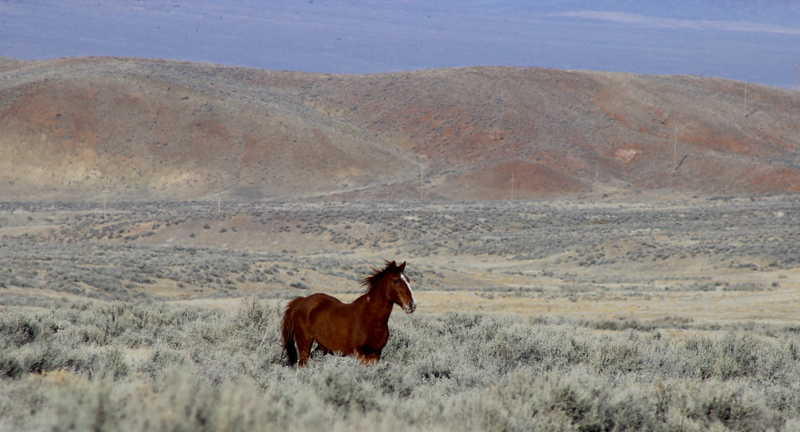 In which region of the Nevada desert are you seeing horses? Great to talk with you! Happy Trails! It’s been awhile since we’ve been over there, but we were in the north on the Shelton Antelope Reserve and Virgin Valley. A few years ago, we found a herd of wild horses at Cold Creek Canyon, which is is not too far north of Las Vegas. We had gone back several times over the years until last year, when we heard that the BLM rounded them up. My wife was devastated and refused to go back. After about 6 months or more, I talked her into taking a drive. We found four horses by the side of the road but they avoided us. After reading this post, I looked up Cold Creek and found this: http://www.lasvegasnow.com/news/28-cold-creek-horses-euthanized-by-blm/230747540.